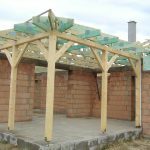 Roof Trusses | K.V.FA-LAK KFT. Economy of materials: no overhead materials contained, the constructions are proportionated statistically. Up to 40 % of the materials can be saved. Precision of proportion / size: items are manufactured in advance, in a system of pre-constructed samples. 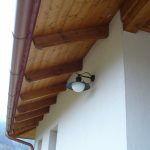 The same type of beams are of the same size. 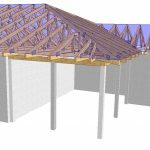 The tymp-arch (roof) constructed by the beams is regular and the roof plain is levelled. 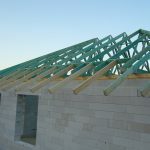 Roof construction with mechanic-like methods: the roofing is built up by beams with identical size which are fixed to each other and other elements with solvent bonds (bindings). The light weight of the elements makes the construction easier. 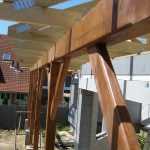 Wide range of materials and types: Any type of roofing form can be built up by laminar roof beams (supporting beams). 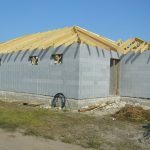 Roof types: symmetrical and asymmetrical saddle roof, hip roof, T and L conjuctions (roof), pent roof, csonka konty and manzárd roof. 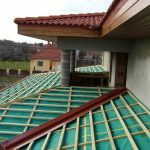 Economy: in case of housing estates, high roof built on flat roof, or in case of agricultural or industrial buildings in large size at which the construction of wooden structures requires lengthy and complicated on-site works this kind of lightweight construction is particularly fast and economical. Fa-lak k.v. 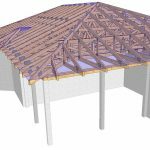 Ltd. undertakes: lightweight detached houses, holiday houses or cottages, industrial and agricultural buildings; from design to turnkey solution. Building of lightweight construction on brick buildings and laminar roofing (laminars/plates drilled in).